Doug and Bobbie’s wedding was all we hoped for and more! For their engagement session, we took a trip to the winery where they were getting married at and the whole time there we kept getting more and more excited to see this beautiful location on the wedding day… and we weren’t disappointed! The natural greenery of the location mixed with great decorative lighting, a few perfect rustic details, and all of Doug and Bobbie’s wonderful smiling friends and family… and it was absolutely a fantastic day to remember! 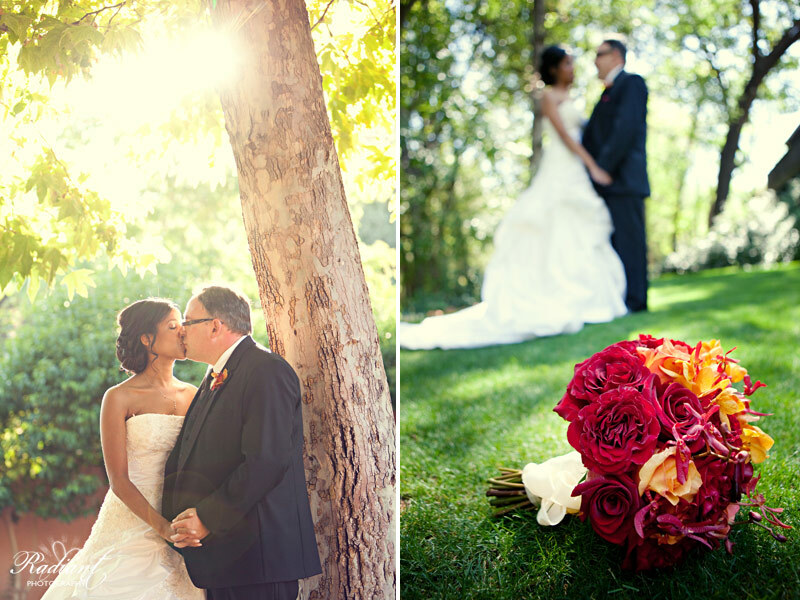 … everything about this wedding was stunning! To give you a little background (in case you don’t remember it from their engagement session) Doug and Bobbie have their own vineyard in Paso Robles, CA. They put their heart and soul into the work there and they really love what they do and where they live. So when it came time for their wedding, they thought it was only appropriate to include their passion for farming grapes into their big day. So they found a vineyard and winery down the road called “Carmody McKnight Estate Wines” and they fell in love with it immediately…you can see why! When I say this wedding had some fantastic personal touches, I mean it! …to gifting their guests with olive oil that was made there that included a special painting on the label done by one of the owners of Carmody McKnight, Gary Carmody. Aside from having the personal connection to the vineyard included in their wedding…the other thing that was super important to them about their wedding was that it be the best party their friends could remember! So they brought in a stage, a band, and all that wine we were talking about… and made it a night to remember (or forget, depending on how much wine you had!). It was a fantastic party that went well into the night amongst the beautiful open space of the vineyards. It was just one of those incredible nights where you look around at the tress, the vines, the stars, and all the smiling faces and you feel more than just contentment, but joy. Thanks to Doug and Bobbie for such a great night! I think it’s safe to say that we had as much fun as your guests and are just as grateful as they are that you threw such a fantastic party! We’re just soooo happy we got to be a part of it all! Thanks for inviting us into your world! Click to see the rest of Doug and Bobbie’s winery wedding (as well as pictures from their rehearsal dinner and day after BBQ at their house). The main thing to say about Alyssa and John’s wedding is that it fit them PERFECTLY! ….and favorite local bar all into their wedding?! John and Alyssa are the only ones I can think of, that’s for sure! I’m not kidding, there were so many perfect details at this wedding that I can’t even fit them all into this blog post so you’ll have to go check them out with the rest of their pictures. There are so many more details to see, like photo fans for guests to wave if they got hot, homemade paper fortune tellers (you know those things you put your fingers into when you were 8 and pinched together to reach different outcomes? ), a vintage book by LIFE Magazine that they used as a guest book, handmade cloth flower boutonnieres with pictures of them as children on them for their parents to wear, chalkboard signs in vintage frames, postcard centerpieces… do you see how much room I’d take up if I put in pictures of all this amazingness!! …and you know… Sasquatch of course (he’s old enough now to be considered vintage right?). Some of the more personal vintage touches were my favorite. For example, yellow was the wedding color that both of their parents had at their own weddings and Alyssa even used the hat her mom wore at her wedding as a flower girl basket! So creative! My favorite family heirloom though was Alyssa’s grandmother’s wedding ring that she wore tied into the back of her lace up dress and tucked in. Her sister wore the ring the same way at her wedding. I almost cried when I heard about this fabulous detail! Even the places they held the events at had special meaning! John and Alyssa live near Newport Beach so they did everything they could to finagle in time to stop by some of their favorite hang outs to get some shots of them in their normal world (only wearing wedding clothes this time!). And I’m SO glad they did, because we got some amazing pictures out of it! (At one of their favorite local bars, Blackies). Their actual wedding was even held at an incredible place that couldn’t have fit the vintage vibe of their wedding any better… the Heritage Museum of Orange County. I have to tell you guys, I was a little skeptical when they first told me they were getting married at a museum… I was picturing dusty, musty statues of very serious looking old dudes with chipping paint. But I have now learned to never doubt the serious style savvy of John and Alyssa who had their wedding at one of the most beautiful museums I’ve ever seen! My favorite part was the old house that Alyssa and her bridesmaids got ready in. Every room, every item, every piece of furniture was authentic… and AWESOME! …you know, take your pick. That’s like, every type of wedding location a person could ever want, all rolled into one… especially when you add in the beach like Alyssa and John did!!! How is it possible that a place like this even exists?!? I don’t think I’m overstating it when I say that this is by far one of the best venues we’ve EVER shot at! There was so much beauty there that I have to say yet again, I don’t have room for all of it on the blog so you’ll just have to go check it out with the rest of their photos. I seriously can’t describe how many very special touches were put on this wedding that just screamed John and Alyssa. I was totally impressed and it was beautiful. Now, about the people themselves…. every time I think of Alyssa, I picture her with a smile on her face. Maybe that’s because she never stops doing it! Not even for her big wedding kiss! Even through her somber, traditional Greek Orthodox ceremony, she looked like she was on a ride at Disneyland (as I heard someone put it). Seriously, doesn’t she have one of the most beautiful, joyful, contagious smiles EVER?!? I absolutely adore it (and her too by the way!)! There is no doubt in my mind that this was the happiest day of her life. And I know it was the happiest day of John’s life because you could tell that all he wanted to do was watch her smile all day… and of course, he got his wish. As you can see, this day had more good surrounding it than I can either describe or show you…as well as plenty of wonderful things from one of the loveliest couples, whom I only have time to give you a brief glimpse into. There couldn’t have been a single thing about the look, the feel, the style, the mood, or the people at Alyssa and John’s wedding that could’ve made it better than it already was. It had it all and then some. Perfection. Click to see the rest of the photos from Alyssa and John’s Dream Wedding. Christen and Jay’s wedding was a very special one for us. We didn’t know Christen at all before we met with her about shooting her wedding and by the time we left our very first meeting with her, we felt like we’d known her forever. We definitely have a lot in common and have many shared passions, including our work with the Princess Program which you may remember from past blogs. In fact, after that first meeting, we had a chance to watch Christen work with the Princess Program’s teen foster girls at one of their events that we photographed and let me tell you, both Scottie and I had tears in our eyes watching Christen work her magic helping these hardened girls soften up so they could have the night of their lives. No matter how difficult, hurt, or shy the teen girl was that she was interacting with, Christen could get her to come out of her shell within minutes and it was like watching a miracle happen. When we left that event, we both felt so lucky that we were going to have the opportunity to work with such an amazing girl. Her love for people and her ability to connect to people from all walks of life is one of the many things that we love about Christen. (As you can see, her parents -in the pics above and below- definitely played a major part in teaching her how to love). Over the time that we worked with her while planning her wedding, our love for Christen grew with each interaction we had. So much so that when we finally got around to meeting Jay (who wasn’t living in the same city during the time of the wedding planning) on the wedding day, both Scottie and I were pretty skeptical that there could be a guy in this world who was good enough for Christen. We definitely felt protective of her and neither of us realized we felt this way until we actually met him and noticed how surprised we were when we discovered that he was perfect for Christen and we liked him a ton immediately! As their wedding day drew on, we found ourselves liking him more and more and our initial assumptions about him were confirmed… he really is an amazing guy and he actually is good enough for the wonderful Christen! (You can tell he’s a good guy because he voluntarily rubs her feet for her!). Every speech made about him, every embrace from one of her family members to him, told us that we weren’t the only ones in the room who felt this way. Not only was this couple themselves super important to us, but their wedding itself had a lot of significance for us because it reminded us SO much of our own wedding! Christen and Jay really love the outdoors and when Christen first emailed me, she was looking for venue suggestions of places that had trees. Considering Phoenix is a desert, she was obviously having a hard time in this quest so I suggested that she do what we did and head up to the forest in Northern, AZ to have a sort of destination wedding (since Christen is originally from South Africa, for many of her family and friends this really was a major destination wedding either way!)! She loved the idea and soon after, they found the perfect place in Heber, AZ. It’s a personal vacation home for a family that Jay knows and it’s called the Legacy Lodge. The Lodge was built in Canada and then all 21,000 square feet of it was transported to Arizona using 20 semi trucks to do it! It has survived fire and flood and continues to be a respite for the family who built it, as well as a place that they are kind enough to share with friends like Christen and Jay. You can read about the Legacy Lodge here, there’s some very interesting tradition tied to it! I have to say, there is just something about a mountain destination wedding that feels like no other kind of wedding to me. Everyone is relaxed and in vacation mode, plus they’ve spent several days together and have already had a great time and made tons of new memories together. There’s just an overall feel of relaxation and calmness amongst the guests at a mountain wedding, which are not exactly the first words you typically think of when you think weddings! It’s a good thing that this was a relaxed wedding by the way, because you really have to be chill when the entire schedule gets changed around to accommodate for rain (which Christen handled very well by the way and everything ended up working out great!). (Getting a little nervous as she looked out at the looming clouds… and all the people she was about to walk in front of!). (Look at those rain clouds! We were able to pop out while the rain stopped for just a few minutes to get these outdoor shots!). We picked up on this chill vibe as soon as we arrived at the lodge property and with the beautiful scenic view of pine trees and a lake, combined with the comforting smell of a wood cabin, Scottie and I immediately felt like we were transported back to June 4, 2005 on our own wedding day. Everything from the scenery, the attitude, the homemade details, to the fresh scent of pine made us feel sentimental and inspired. Adding to our homey/comfortable feel, was the fact that we got to work with a wedding planner we’ve worked with many times before, Margie Walinski at Party Presentations (who did a fabulous job making this beautiful wedding happen by the way!). (The little flower girl was smiling up at them like that throughout the entire ceremony! So cute!). We were also surprised to find that our good friend Jay Worsley, from Everly Films, was hired last minute to be the videographer! See the wedding video trailer here to get even more of the experience from this wedding day! The entire wedding was beautiful and covered with personal touches! There was even a little bit of South African food to top it all off and give us a taste of Christen’s homeland! It seems to me that when you realize that you are better with someone than you are by yourself, you know you’re doing the right thing by getting married and I can definitely say I believe this is true for Christen and Jay. They truly are the perfect team and I think their mutual love for people will prove stronger with them working together as a married couple than it would be if they continued on with their lives as separate individuals. Thanks to the both of you for being such amazing, incredible people and for giving us the opportunity to work with you! 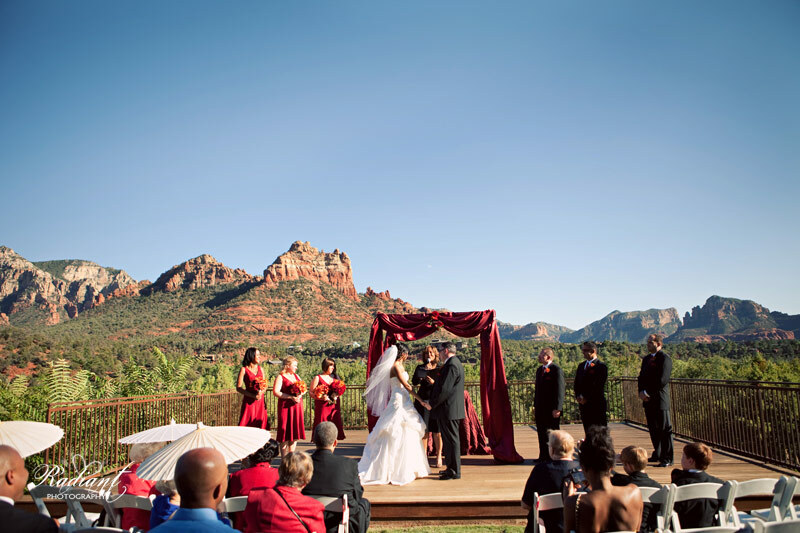 We couldn’t have hoped to work with a better couple on a better wedding! Thanks so much! We can’t wait for you to see the pictures from your UNIQUE SESSION that we shot of the two of you the day after your wedding… I think you’re going to absolutely love them- we do!! Coming soon! Click to see the rest of Christen and Jay’s Mountain Wedding Photos. Stephanie and Garrison have quite a history with Radiant, so we were beyond stoked when they called us and asked us to be a part of the biggest day of their lives! To make a long story short, it wasn’t until after we’d already established a relationship with both Stephanie’s family and Garrison’s family, as well as shot one wedding for each, that we found out that my mom went to school with one of each of their parents! So of course, this means that Stephanie’s dad and Garrison’s mom also went to school together. They did, but that’s not even how Stephanie and Garrison met! Their story’s even cuter than that! Here’s how it happened… Stephanie took a job dog sitting next door to Garrison’s parent’s house. Apparently, the neighbor had previously informed Garrison that a really pretty girl was next door that he might want to find a way to meet… so he took the advice and did just that. (Good thing he did too… I mean, just look at her!). Garrison threw a frisbee over the wall on “accident” and had to go knock on the door to meet Stephanie and “get the frisbee”. Genius isn’t it?! It definitely worked and they spent the rest of her dog sitting experience that summer hanging out together. It wasn’t until down the road that they figured out that their parents not only went to high school together, but were actually neighbors! And of course considering that Stephanie and Garrison met being neighbors… this story just couldn’t get any more adorable! As I mentioned, this was not the first Radiant wedding for either Stephanie or Garrison’s family. Before we shot their wedding, we had also photographed weddings for both Garrison’s sister and Stephanie’s sister! So there were three couples at this wedding who are related who’s wedding we’ve been a part of. How awesome is that?! So a chance to work with two of our favorite families again at the same wedding… in July in Phoenix when it’s 112 degrees outside… totally worth it. At least it wasn’t the day before which hit a record setting 118 degrees Fahrenheit! I can’t even explain to you how much I love seeing two incredible families join together like this! You should’ve SEEN that party on the dance floor. Oh yes, everyone in both of those families knows how to have a good time and when you put that many fun people in one room together, you’re going to have one fantastic party! (Stephanie’s sister and her husband entertaining the newly weds!). I seriously was smiling during the entire reception because it was so much fun watching all these wonderful people that I care so much about having fun together and busting a move while celebrating such a beautiful thing as a wedding together. As if these two families could get any cooler, I noticed one major thing at this wedding that really stood out to me and spoke volumes about the quality of these families. All the in-laws for all the kids in these two families were present at this wedding. That means that when one of the kids in either Stephanie or Garrison’s families gets married, their entire family adopts their new family in as one of their own. Of course that’s what’s supposed to happen when two people get married, but how often does it really? I thought that said a lot about these people! (Garrison’s dad prepping the get away car with his son-in-law). Now that I’ve gone on and on about their families, let me tell you about Stephanie and Garrison themselves! (Like our Facebook page to tag yourself in some of the photos… including the photobooth photos!). When I remember them on their wedding day, the first thing I think of is how freaking adorable they were together! It didn’t matter what chaos was going on or what pressing matters there were for them to attend to, when they were together, nothing else mattered and all else faded into the background. I was so glad they chose to do a reveal moment and see one another before the ceremony because as soon as they were together, the stresses of the day just seemed to melt off their shoulders… which is exactly how a wedding day should be. I don’t think there’s anything you could say to convince me that these two aren’t madly and completely in love. I think they had love coming out of their pores! Along with the sweat that 117 inevitably brings! To sum up…this perfect wedding day included a beautiful venue (if you haven’t been to The Clayton on the Park yet, put that on your to do list because it’s a must see! ), 2 lovely families, a rocking party, and a head over heels in love couple… what more could you ask for on a wedding day?! Stephanie and Garrison, thank you oh so very much for letting us into your lives on this special day and for being as wonderful to each other as you are. Just being around you two together makes me happy! We love you both and we wish you the best! Congratulations! Click to see the rest of Stephanie and Garrison’s wedding photos (and the photobooth pictures! )!